The Tasmanian Society for Information Technology in Education (TASITE), with generous support from Google, will provide and develop events that relate directly to computer science elements of the ACARA Digital Technologies curriculum. 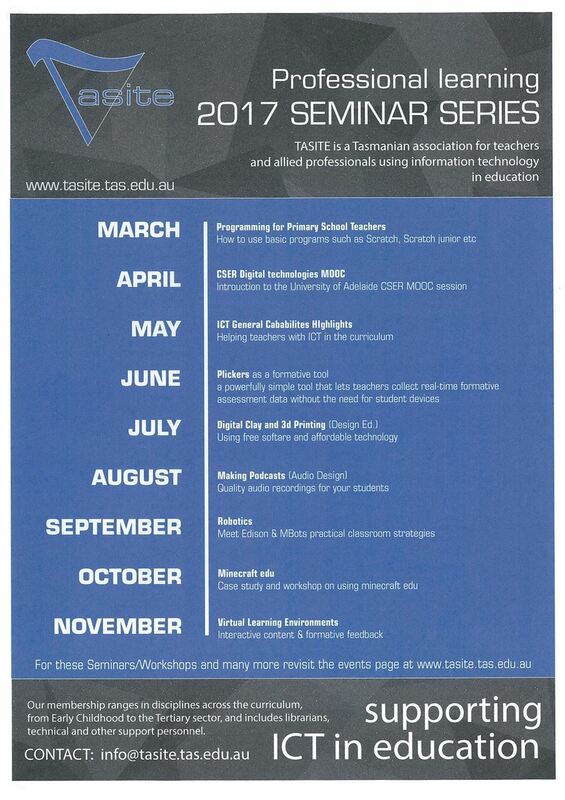 The primary focus area is to support teachers who are implementing the Digital Technologies curriculum in Tasmania. Particularly schools in remote and regional areas. The West Coast and island schools are of special concern where there is a need to introduce the Australian Digital Technologies curriculum. Workshops and events are designed to support computational thinking skills. Events will be coordinated around the State in Hobart, Launceston, Burnie and Queenstown. Robotics, coding, programming eg Arduino devices, VIVE and Google Expeditions introduction, CSUnplugged activities along with other events are planned. Partnerships with UTAS and the CSIRO and a VIVE expert have been arranged. Further, Teachers are also being encouraged to take up the CSER MOOC from Adelaide University. Events will be aligned to the Australian Digital Technologies curriculum and focus on the the outcomes of computational, systems and design thinking.